Dr Andrew Weatherall with an introduction to a new type of thing (well, for this site anyway). Well, we finally thought we should try chatting. After much delay we finally sat down and tried recording a chat with a microphone. And then after a much longer delay I have finally spent some time learning what to do with all that noise. All that slightly-too-quick-talking noise. This effort features me chatting with Dr Alan Garner about those times you need to decompress the pleural space. It seems to be an area where a lot of people have passionate ideas about how and when to intervene. This makes it ideal for a chat, although maybe harder to be definitive about what to do. While Alan makes the argument that many of the disadvantages of tube thoracostomy first solved by the open technique have other solutions apparent in modern practice. However, all the options have some advantages and disadvantages, benefits and complications. That’s part of why it’s such an interesting topic. 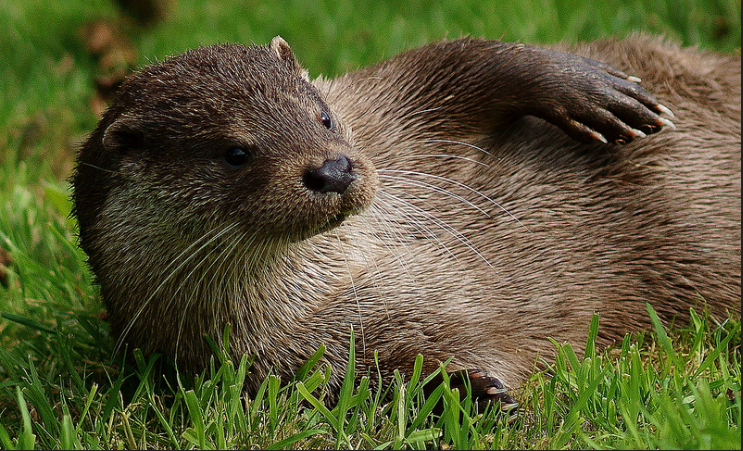 This would be the point for a tenuous link to the concept of lying back and enjoying the talk like this otter. It’s just an excuse to share the otter. So here is our first podcast for download (or here’s the permalink or the whole player thing). We sort of hope it will lead to plenty of associated convivial coffee-based chats. This is very much a learning thing at this end. So if there’s a few rough bits in the audio/recording and the like feel free to send some constructive feedback. Promise to get better at it. This chat actually happened way back in December (!!!) so apologies for taking this long to get it together. What that does mean is there’s a couple of bits that need an update – most particularly that the good Dr Garner has moved on from the Medical Director position at CareFlight. The excellent Dr Toby Fogg does that now (while Alan is still working pretty much as hard as ever, just not everywhere all at once). At the end of the podcast, we have a chat about the need for research. Well I don’t know if that got him moving but Alan is now putting together a retrospective study involving lots of centres and services across Sydney. Hopefully this will provide some more evidence to add to the mix and inform how to do future research better. Deakin CD, Davies G, Wilson A. J Simple thoracostomy avoids chest drain insertion in prehospital trauma. J Trauma 1995;39:373-4. Massarutti D, Trillò Gm Berlot G, Tomasini A, Bacer B, D’Orlando L, Viviani M, Rinaldi A, Babuin A, Burato L, Carchietti E. Simple thoracostomy in prehospital trauma management is safe and effective: a 2-year experience by helicopter emergency medical crews. Eur J Emerg Med 2006;12:276-80. Aylwin CJ, Brohi K, Davies GD, Walsh MS. Pre-Hospital and In-Hospital Thoracostomy: Indications and Complications. Ann R Coll Surg Engl. 2008;90:54-7. Maybauer MO, Geisser W, Wolff H, Maybauer DM. Incidence and outcome of tube thoracostomy positioning in trauma patients .Prehosp Emerg Care 2012;16:237-41. Oh, and as a tracheal tube is sometimes suggested as an alternative to an intercostal catheter, it’s worth looking up this recent letter to the editor from Emergency Medicine Australasia, where a patient was unstable during transport with a tracheal tube in place to maintain the thoracostomy and subsequent investigation in hospital showed it had migrated. Yep, all techniques have their problems. Minh Le Cong reminded me that the draft NICE guidelines relating to trauma are up for people to comment on and obviously mention chest injury amongst many other things. Well worth a look (possibly via the excellent summary by Natalie May at St Emlyn’s. A big thanks to Dr Minh Le Cong for the encouragement and advice. We tried out two bits of music for this podcast and they were sourced from the lovely Podington Bear at the Free Music Archive. The first is ‘Mute Groove’ off the ‘Equatorial’ album. The end track is ‘Dole it Out’ from the album ‘Grit’. Along the way I also picked up many useful tips from Joel Werner and Samuel Webster (disclosure: the good Mr Webster is my brother-in-law but is quite a good artist and everything person and I suspect I would have come across his work anyway). The image here was from the flickr Creative Commons area and shared by Peter Trimming. It isn’t altered. Previous PostFidelity – can you have too much of a good thing?Next PostDoes video make for little airway stars? thanks guys for one of the best prehospital podcasts I have heard this year! I wanted to challenge the notion of your advocacy for prehospital ultrasound in assessment and management of traumatic pneumothorax in the prehospital setting. First let me say tension pneumothorax inflight during aeromedical retrieval is exactly the case index reason why I began learning bedside USS in my career. Scary stuff that spurred my ultrasound pathway! Having said that, I must admit the enthusiasm for prehospital USS in regard to pneumothorax is not at well grounded as we would like! in fact it borders on a degree of what is referred to as Sonosturbation in the field! I know at least one senior prehospital doctor who argues that pneumothorax assessment and management should be purely a clinical issue and that USS just muddies the waters. In his opinion a tension pneumo should be Diagnosed on clinical grounds and the treatment is straightforward. I actually agree with Alan that a chest tube prehospital should be the standard of care. Isnt that the whole idea of prehospital doctors after all..to bring hospital standard of care to the prehospital environs? anyway, recently I have noted a few cases of my colleagues doing prehosp USS for chest trauma, not finding a pneumothorax , flying them and then on arrival a CXR finds a pneumothorax that sometimes needs an ICC. Clearly either a false negative of prehosp USS or some argue a pneumo that develops with aeromedical transfer. Either way it begs question what the prehosp USS adds in this setting! I can hear you both shouting now that prehosp USS to rule out pneumo prior to IPPV of chest trauma patient..but even here I dont think that will change things. if they need IPPV they need it. If they have pneumo, it will get worse with IPPV and you should be able to assess it after IPPV started like trouble shooting any post IPPV deterioration as Alan says. What the prehosp USS adds to all this is uncertain and at best anecdotal based medicine. As for pneumothorax, its hard to prove what prehosp USS adds to our care apart from enthusiastic use and Sonoselfgratification! and in fact maybe quite falsely reassuring. Thanks for the very kind feedback Minh. Hopefully now we’ve done it once we’ll be quicker getting back to it. It seems a bit less scary now. Really interesting perspective with some points I entirely agree with. I’ll try and poke Alan to pop on later. In the meantime, some thoughts in return. And no shouting from me. That’s now how I operate I promise. I completely agree that ultrasound use in prehospital care can quickly descend into ‘overuse because of cool gadget’. I’m also not personally aware of good outcomes-based evidence on how it impacts on patients. What I can clarify is the way I go about incorporating it into clinical assessment and decision-making because I think that addresses some of the potential flaws you identify so neatly. As part of my initial assessment of chest and haemodynamics, I incorporate a quick ultrasound of the chest. I don’t view it as a replacement for other elements of the clinical assessment, but I do add it as extra clinical information. Relying on it alone sounds like balancing on a one-legged stool. I have not used it to diagnose tension pneumothorax, where there is both respiratory signs plus haemodynamic compromise, because I agree that is a rapid clinical diagnosis that shouldn’t require ultrasound. Where I think ultrasound has a role is in the patient with a degree of respiratory compromise where I am trying to clarify in my mind a priority list. I try to recognise it has its limitations like all the other elements of clinical assessment of pneumothorax. So in the patient where there is evidence of hypoxia, I add a quick ultrasound (takes but a few seconds). If I see normal lung sliding, I am reassured that consideration of decompression is not an early priority. If I don’t see that normal sign (remembering I’ve already decided there isn’t tension), then I can make a note this is more likely to be a step in management. I can also share that assessment with my colleagues at the scene who can visualise the screen and be aware of my thinking. We can then factor this into our “and next … and next” planning. I find it has extra benefit in getting us on the same page. So let’s say we’ve assessed a need for RSI, performed it and just can’t get oxygenation better. If I knew there were ultrasound findings consistent with pneumothorax, I’d have higher on my list of treatment options decompression. If I had already added normal ultrasound findings into my assessment suggesting pneumothorax wasn’t a clinical issue right now, I’d be more likely to try alternate manoeuvres (suction, recruitment, PEEP etc). I have used ultrasound exactly for this previously. The patient gets more appropriate treatment for the actual cause of their hypoxia because I haven’t attempted decompression. I find looking at the Aylwin paper interesting on this question of how to be confident the patient has an indication for decompression, if we start at the point that says “you need hypoxia, plus evidence of pneumothorax, not just one”. It included 29% of patients with prehospital thoracostomies for which there was no discernible indication for thoracostomy in a setting where relative indications include “hypoxia or hypotension + chest signs on one side” or “PPV + chest signs on one side”. That’s a broad set of criteria. And still nearly one third of patients having the procedure didn’t meet that low bar (although it’s easier to set those bars from the hospital looking back at the scene of the injury). One patient had a chest drain on the opposite side to an isolated stab wound. An extra check that can prompt the thought “wait, there’s normal signs on this side of the chest, maybe the hypoxia is something else, look harder” would surely have helped some of that 29%. An addition to my clinical assessment that takes a few seconds (plus the bonus of reaching some patients with a probe hand where I can’t get close enough to listen or look front on) that can help me with a diagnosis point of “is pneumothorax a likely cause of compromise right now” so I can choose the best treatment for any hypoxia right now is a useful part of my assessment. I hope it’s never the whole assessment. The one other point I’d make is that people cleverer than me have always taught me that ultrasound isn’t that much use in trauma as a single point investigation. I’d be interested in your process, but as a pretty simple guy I find myself on these prehospital jobs repeating ‘ABC’ more often than a Jackson 5 covers band. So after each key intervention I tend to verbalise with my colleague “this is where we’re up to, this is what I think is next, is there anything I’ve missed, do we need to reassess?” As part of this I try to confirm I’m happy airway care is appropriate right now, reassess breathing status and reassess circulatory status etc. As part of ‘B’, I’ll generally reassess incorporating a quick repeat chest US – “pneumothorax wasn’t an issue 5 minutes ago, is there evidence that may have changed?” being my thought process. Still normal ultrasound examination and patient OK on B and C – OK, I can consider another step in assessment and management. Abnormal ultrasound examination – has patient condition changed? No – carry on but be mindful something might be evolving, heightened awareness of need to come back and reassess. Patient condition has changed – stop, double check assessment and plan. Haemodynamics changing + normal chest ultrasound exam – likely not in the chest right now, is there bleeding somewhere else? The US informs the decision tree but doesn’t define it. Anyway, I think that describes my process. I am very open to clever thoughts on the strengths and flaws of this approach. Ultrasound isn’t the whole of the story in diagnosing and managing pneumothorax, but I think it adds useful, rapidly available information in a setting where clinical diagnosis has its own flaws. Would good research focussed on patient outcomes re: US use help? Absolutely. I find there’s often grey zones in assessment in prehospital trauma. It turns out the sometimes shadowy pixels on the ultrasound can sometimes make those zones a little less grey. Thanks so much for the comment Minh. however to play devil’s advocate, I think we need to admit to ourselves that what you speak of is still no more than anecdotal based medicine and whilst we may convince ourselves to its utility , this may be nothing more than bias and self indulgence. if a patient is stable then what use is the quick scan? whilst I agree bedside USS is handy for rapidly ruling out some causes of the deteriorating patient, I am uncertain as to its role in routine physical assessment of the otherwise stable pt. let me try to illustrate with a teaching case I use, albeit its not trauma related. 9yo girl with severe asthma episode. Thanks Minh. Yep, as I mentioned we’re still in need of studies looking at patient outcomes and that’s why I can only share how I use it to explain my relative certainty it provides a little increment in the care I give. And if they’re stable, in the trauma setting, it still adds either “no significant pneumothorax right now” or “there’s a pneumothorax but it is non-compromising now, but I’d better be switched on to that if the patient changes” and that’s still something. I also get the story, inspect, palpate and auscultate in the stable trauma patient as part of trying to stay comprehensive in my approach. The US is just a 10 second part of the examination which offers some info the other steps don’t. Thanks Minh for the discussion and apologies for the delay replying – been busy training new registrars. My first comment is that ultrasound is now very much incorporated into my examination of the patient, like listening with the stethoscope (where this is feasible). You illicit signs and put together the clinical picture. The additional information the ultrasound provides can be priceless in some patients though. Soft breath sounds on one side and hypoxia in a trauma patient can be pneumothorax, contusion or sometimes both. A positive finding of sliding on ultrasound means no chest decompression and add some PEEP. I think the problem with ultrasound in the prehospital world is the same as in the hospital context – it is very operator dependent. Having said that, the positive identification of pleural sliding is an extremely re-assuring sign. You cant rule out a small pneumothorax unless you move the probe around a bit and scan a few intercostal spaces but if you definitely see sliding in the mid-clavicular line in the second intercostal space of a supine patient, then even if a pneumothorax is present it cant be big enough to be causing hypoxia, hypotension or high airway pressures – you need to keep looking elsewhere and not waist time making holes. The other thing is that re-assessment of the patient should be ongoing and the ultrasound component of the exam is the same. Just because you see sliding the first time does not mean the small pneumothorax you did not see on the first pass is not now bigger. But ultrasound is so fast and easy to perform that this is now not an issue, even in flight. Although being “handheld” some of the older, chunkier machines are a bit clunky in this context. We are now using the new GE dual probe Vscan on our helicopters (no competing interests to declare here). The high frequency linear probe provides great images of the pleural line, even without gel. The machine is so small it is no hassle to use even in a small helicopter cabin like the BK117 we have in Sydney and you don’t have to pull one probe out and plug in the other when you change exams. Use in the stable patient is an interesting question. Stability is a relative term. Two cases that we did today by helicopter might illustrate this. In Sydney we were called to a downed motorcyclist and our team was in contact with the patient eleven minutes after the beginning of the tasking phone call. This is very early in the evolution of the patient’s pathology. Things can change very fast and knowing that one of the lungs is not in contact with the chest wall despite the patient having normal vital signs is very useful information for when things change. If I find free fluid in his abdomen despite current haemodynamic stability you have good reason to get some tranexamic acid in early. The other case we did by helicopter today was in the Northern Territory. The incident location was more than 400kms away with the team taking more than 2 hours to reach the patient (no nearby strip for a fixed wing). If they are still stable more than 2hours post injury you are in a rather different place. However ultrasound is now such a routine part of my physical exam I would just do it anyway because a normal ultrasound of lung and abdomen is again very re-assuring even in this context. If the exam is normal at this stage it is not likely to change. The motorcyclist in Sydney is a quite different case of course. In 10 minutes time everything could be different and often is. So to use Andrew’s phrase it is redoing the ABC more often than the Jackson Five cover band and ultrasound is just a part of this ongoing reassessment. How often you redo it in the stable patient depends on how long ago the injury was. If it was more than 2 hours ago, once is probably enough unless something changes. If the injury was 15 minutes ago and the mechanism is impressive or they have other significant injuries the re-assessment would be ongoing till I hit the hospital. I don’t think you can be too paranoid in the early phase.